Have you been working under your boss for a few years and now you feel like you need a change? Do you think an internal transfer will help you grow, evolve and change? Are you sure there is better scope for you outside the department you are working under? If the answer is a YES, then you definitely need an internal transfer. And even though it isn’t very easy to accomplish, we promise to make things easier through this post! When mentioning about the transfer to another team, the first thing that one should have is the confidence and a strong reason, as to why you want to change the department. Remember that the reason should not sound immature and selfish rather it should be convincing and focused towards career development. Do you like to explore new things, works or locations? Are you good at networking ? These are the first few questions you should ask yourself when asking for a transfer of team to your boss. Not only these, there might be several other reasons that have molded you to take such decision, but the only suggestion is to be specific on what you actually want. Acquiring a transfer as you wish is not that easy, you really need to convince your employer. So think positively and act smartly. Job transfers are a great way for opening new way and paths for your career development. You will be having the chance to gain good skills and new methodologies which can help you in the long run. Moreover being in the same organization preserves your experience. You will also be well versed with the company culture. There are several advantages that come with an internal job transfer. You will get it easily because you are an employee already. There will be no on-boarding costs. People will know your quality of work. The process of transfer will be easy since its from within the company. The disadvantages include your boss might not be wanting to lose you or they could think you don’t possess the skills needed. 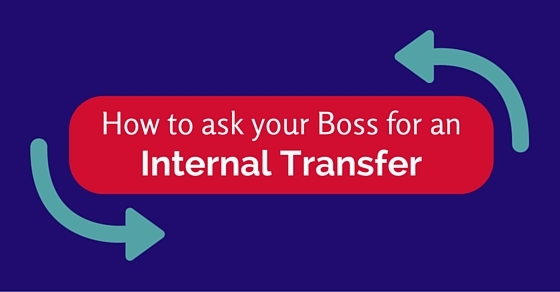 Before you ask your boss about an internal transfer, there are a couple of things you should never forget to ask. First of all, make sure the job is available to you. There are a lot of people who try for things like this and then end up getting highly disappointed because then they realize the job wasn’t open for transfer at all. You also need to inform your HR that you are keen on getting it. Make sure you are qualified for the job as well. Apart from that, you have to see whether you have a turnover plan or not. The following mentioned are few tips for how to transfer to another department at work. The first thing you should do is think why you are keen on leaving the job that you have. Is the work environment not suiting you? Do you want to do better than the job you have right now? Think of all these reasons at first. Think of why the new job will help you more and whether the reasons you have at this point are valid enough or not. You don’t want to end up moving your job because of some nonsensical reason. So just think this through! A second thing that will help you is self assessment. Take a pen and paper and write down all the skills and experiences you have had in the past couple of years. What has brought you to this position and how have you improved. When you start making a note of this, you will be able to uncover any of the gaps. Also you will be able to brush up on some of the skills and make sure your resume and CV is worth a good look. You will be worth the transfer once you are sure. Also remember to check out the internal process of application and how it is being carried out. You also need to talk to the manager directly and see how you can apply. Plus check whether you need to give a resume of any kind. You will be successful if you have a good idea on the channels of communication and this will not put your position in jeopardy. Your networking skills should also be on point. When you are working for a particular department and asking about a position, you would like to work for the future, it will help you improve your networking area. Also it will be a great opportunity for you to know more. If you don’t know anybody, you wont be gaining any information. So don’t lose out on that! You should start researching the positions that are already available for a transfer. It is a great place to begin your research. There are several job boards available today. So don’t forget to try any of them. Career Builder and Monster are some of the examples. They give you different positions which will not be available on the site. Then you may also identify the position that you are seeking and what are the skills that are needed. Look out for the hiring manager and see if there is any contact information. This step is also highly important. Never forget to upgrade your resume if you want a job transfer. This will help you know the skills you have at this point including the tasks and projects. Plus you must have attended a few seminars. Make a note of them all. Mention a cover letter as well. Write why you will be good enough for a job transfer and why another position will suit you better. You should also emphasize on how much you enjoy working for the company and that you would like to work towards their mission. This is why you have been asking for the job transfer. 7. So how difficult will it be for your boss fill in the gap once you leave? For this you should have a good idea about the transition plan. Check whether it involves a new period where you are expected to be shared between the old and new group. This should also include your new boss. If you go by our recommendation, then we would ask you to change yourself into a new group and stop doing the work you were doing for the old group. Or the old group will probably be a part of delaying old tactics, even though if the reason is to replace another person. If you want to ask your boss for an internal transfer, then do a request for a one to one meeting with them. This should be for requesting a transfer at work. There is technology available that will provide you with several tempting ways using which you can keep away from confrontation. But if he doesn’t respond to your emails or texts, it means that you are not ready for face time yet. You can also get hold of written proof to the meeting. Documents and other proofs should be ready so that your boss will sign them. When you are attending the meeting, make sure you are direct and honest right there. Your boss will then begin to respect you. It will look like you are keen on saving your time as well as his. Plus beating about the bush never works. You should always come to the point soon enough. So tell him where you are going and why. Whatever the reason is, make sure you are saying it quickly enough. Do not waste any time at all during this process. Apart from being honest and straight to the point, you should also give reasons why you are the best candidate and what makes you so ideal. Have some points written beforehand so that your words can make a good impact on your boss. You should be able to convince him that you are ready for an internal transfer. Next what you should do is thank your boss. Thank him/her for what you have learnt so far from him and all the experiences that you’ve had is because of him. Everything that you will carry to the next company is also because of him. So make sure to express enough gratitude. Even if you have been dancing the two step since you have found out about the transfer, make sure to express a bit of the remorse about leaving so that it doesn’t look as if you are a jumping ship or something similar. Before the meeting comes to an end, you should check if he is ready for some kind of professional networking in the future. If it is a YES, then get hold of his contact information. Since your boss knows the kind of education you have received and the educational background you possess along with the working style, you should have some kind of contact in the industry. Also getting a letter of recommendation from him will always be helpful for you. So always remember to check with your boss about things like this. Before you speak to your boss, make sure you have honed your skills and are all set for the interview. Also have a positive attitude and remain confident throughout. And if you know someone who is looking for an internal transfer right now, do let them know about this post. Plus if you have a couple of ideas and suggestions you’d like to give, feel free to comment below. We would love to hear from you! Previous articleHow to Work and Stay Focused on your Goals?